Little Life of L: What we ate last week: Poorly kids, date days and school discos. 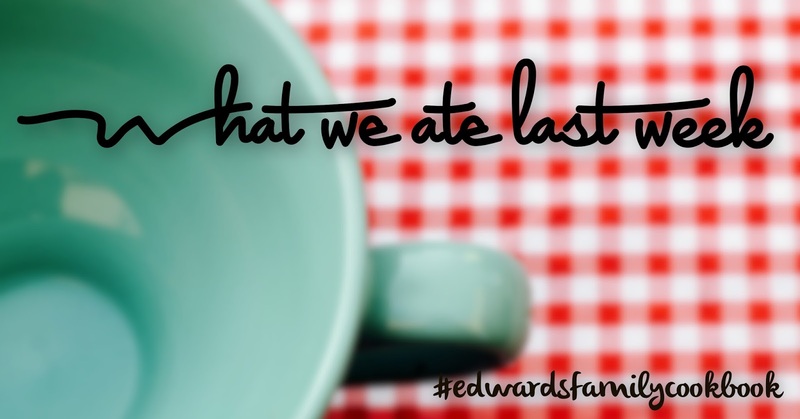 What we ate last week: Poorly kids, date days and school discos. n the drive home with sore feet, smeared glittery face paint and slightly red shoulders we stopped off at KFC. Now this is very rare since loosing weight both us avoid fast food places mainly but we needed food, quick and this hit the spot. Just a meal each and small fries. A satisfying end to a fun day. Sunday : Bacon, Spinach and Cheese pasta bake. Collecting the boys and heading off to visit friends was a lovely way to spend a Sunday. Except in my infinite wisdom I had made plans to dismantle and get rid of chest of drawers in the boys room and replace with a large Kallax unit. This meant while I sorting the littlest pest to bed, hubby was on building IKEA furniture duty. We needed a dinner that was quick. While the pasta boiled, I fried off some bacon (far removed) once that was cooked through emptied a bag of spinach in giving it a rough chop with some scissors. Added the cooked pasta and then half a pot of cheese sauce (the other half used last week with the pizza). Stir through and tipped into a dish. A sprinkle of low fat mature cheddar and into the oven. A quick and simple dish but left us full. Monday : beef curry with carrots, squash and sweet potato. As usual Monday evening was looking like a busy one with school pick ups, forgotten homework from the weekend, beavers bbq and AGM meeting and arranging pick up of smallest. In attempt to be organized I cooked up the the curry during the day and left to simmer while sorting through the never ending battle of odd socks. This meant that once we were all home and kids in bed mine and the husbands dinner was just a case of warming up the curry and steaming some rice. I used beef stewing steak which I browned with some sliced onions. Before adding in couple handfuls of frozen squash, a chopped and peeled sweet potato and a couple of carrots. A good sprinkle of curry powder, garlic granules, mixed seasoning, salt and pepper plus some hot water and half a can of coconut milk. The beef cooked down lovely and the vegetables in the curry gave it a lovely thick consistency. We love fish however I find it quite pricey in relation to size so it's not often something we have. This week we quite fancied some salmon fillets which are my favourite and super quick for meals. Tuesday are full of busy bits and pieces and this was no different. I threw together this baked fish inspired by a similar one I do from Nigella Lawson Simple cookbook with bacon, sweet potatoes and asparagus. I sliced the sweet potatoes (still with the skin on) into thick rounds and laying them on the bottom of a pan. I wedged in the salmon skin down and piled the asparagus on top. A good drizzle of olive oil and a sprinkle of herbs and spices before adding into a hot oven. I left it uncovered for the first 20 minutes then covered it will the pan lid and left it to cook for another 20 minutes or so. I have this fantastic cast iron shallow casserole dish from Sainsburys. I adore it and it's the perfect thing for this dish. Also once out the oven it kept the food warm for a long time. Long enough to get terrors into bed at least. It was all planned that I would work a full week. My last full week at work before I morphed into summer holiday mode mum. But plans changed. My eldest woke in the night crying in pain with a headache. After some water, some calpol and some cuddles he was feeling better and slept. On the sofa. With me. So you can guess that by the morning I was a little worse for wear. We decided to keep him off school which meant I was in mummy at home auto pilot- which meant I did washing, stripped bed and tidied. In the midst of all this I roasted a chicken and cooked a few roast potatoes and carrots. A kind of mini roast. I had plans with a pizza express, a bottle of wine and some best old friends. Being the good wife that I am I cooked all this up so husband could eat well. My Florentine pizza (with a béchamel base) a crisp white Chardonnay and a chocolate brownie with a macchiato chaser was just the job. Putting the world to rights. My parents love a garden centre. One of their favourites is Poll Hill in Tunbridge. It has a lovely cafe, good selection, outside play area and an amazing butchers and farm shop. The meat from here is always lovely and we got treated to a couple of trays of minted lamb chump chops. So good. I love the combination of minty sauce and sweet lamb. Lamb is favourite of mine but not often served due to it being on the more expensive side. I was very pleased with these just baked in the oven and the excess fat drained. Before stir frying green beans with salt and pairing with a crunchy skinned jacket. Simple dinner packed with flavour. The boys needed to eat earlier - as usual on a Thursday. I cooked up a pack of Honey and Pork chipolatas from Tesco - which were yummy and tasted lovely. 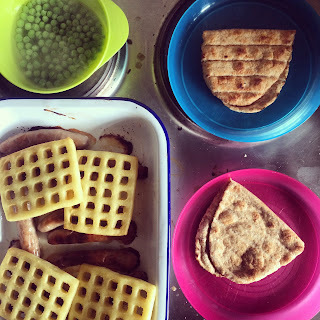 Added some peas, potato waffles and wholemeal flat breads for a quick but filling meal for the boys. Earlier this week I popped into Sainsbury’s for milk. 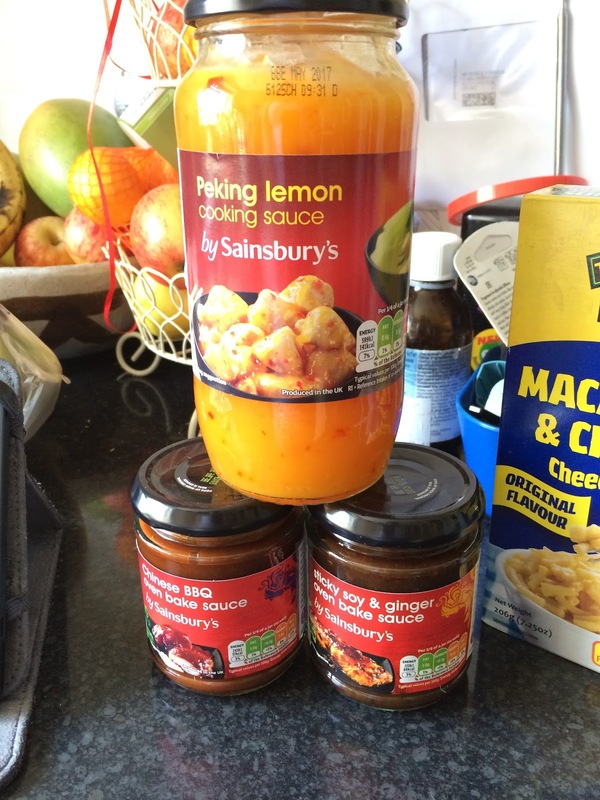 And came out £12 lighter… I can't be the only person that happens to in a supermarket. I spotted this jarred sauces which were 94p each. Bargain. As much as I cooked from scratch I like to have a little back up in my cupboards. And these fitted the bill on Friday. It was the school disco, plus having to collect the shopping order that I grabbed the kids McDonalds which they ate in the car- thanks to Friday night traffic in Croydon. By the time I got home I threw this together and chucked it into the oven. Cut of strips of belly pork, added two chopped peppers, some spring onions, and a bag of sugar snap peas. Added the jar of sticky soy sauce and coated it all. Added a sprinkle of sesame seeds. I left it in the oven for around an hour, gave it stir half way. 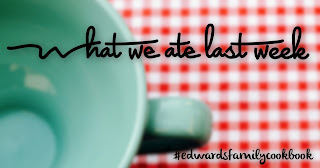 Steamed some rice and we ate out of bowls while curled on the sofa and the kids were asleep. Looks and sounds like you had some lovely meals last week! 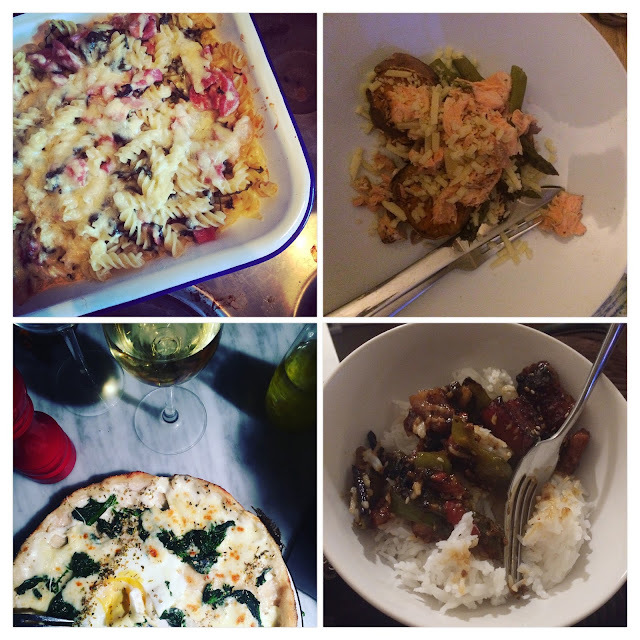 A few treats are nice too, we do love Pizza Express! Thanks so much for sharing at #KCACOLS please do come back next time!